Our Best Carpet Cleaning Secrets Revealed! To remove stains and deodorize your carpet mix a general cleaning solution of Clean-n-Brite. Remove as much of the dirt or liquid as possible. Squirt Clean-n-Brite on spot and let stand for 60 seconds. Soak up any remaining cleaner with a clean terry cloth towel and vacuum thoroughly when completely dry. Add 1 scoop of Clean-n-Brite per gallon of hot water. Using Clean-n-Brite will reduce the amount of time, labor and expensive chemicals traditionally needed to clean carpets. Clean-n-Brite may be used in any type of carpet cleaning machine, Bissell, Hoover, steam cleaners, shampooers, rental machines etc. 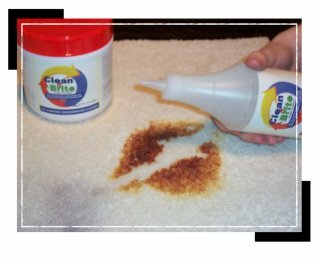 The next time you rent a carpet cleaning machine at the grocery store don't buy those expensive cleaning supplies, just use Clean-n-Brite. Best of all Clean-n-Brite doesn't make a lot of foam, so you don't need to buy that expensive defoaming solution. Defoaming solution is one of the most expensive products that most people buy. Are you tired of filling and emptying your Carpet Machine? Now you can clean faster, with better results... empty the dirty water tank less, fill the cleaning solution tank fewer times! With Clean-n-brite you'll use less water to clean your carpets. Just spray the stain and make one pass with your machine and the stain is gone! Now you can empty your dirty water tank less frequently too! Clean-n-Brite evaporates water so fast that you may be able to clean your whole house without having to empty the waste water tank on your carpet machine even one time. Less stops and starts means you'll be done cleaning faster. Finally, your carpets will dry faster than you've ever seen using Clean-n-Brite. Our product helps to evaporate water, which means your carpets will be dry in just a fraction of the time those other cleaners take. Remember that with Clean-n-Brite you'll use less water too, just a spray of Clean-n-Brite will remove a stain instantly. Don't over wet your carpet, it could damage the pad and carpet backing. If you want to clean carpets fast and effectively, maybe faster than most professionals, try Clean-n-Brite today. After all it costs a lot less than all of those other high cost products that you've already tried. Try it, you'll like it!